Forget VLAN and complicated networking setups from other HDMI manufacturers. Video Storm NetPlay offers simple IP network setup and scales up to a 1000 TVs. It has revolutionized HDMI video distribution. NetPlay is the first HDCP enabled network based HDMI matrix to utilize high quality H.264 video encoding, the same technology used to master Blu-ray discs. Video Storm is your solution in the commercial space for restaurant and sports bar installs. Video Storm NetPlay offers flexibility and scalability along with a plethora of exciting features. Digital signage, video wall and video tiling are the most popular for sports bar venues and are included for free in every NetPlay Video system. NetPlay HDMI distribution enables applications that were previously cost prohibitive. Imagine being able to retrofit a full HDMI video, cloud audio and central and local audio distribution system without having to run a single wire. How about commercial systems with hundreds of displays and sources? NetPlay delivers these solutions at the right price. Features such as videowall, video tiling, digital signage, and many more come with the systeh. For Android solution: NetPlay systems include our own control system (NetPlay Mobile) optimized for commercial systems such as sports bars. 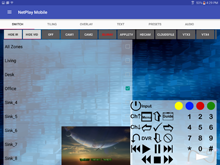 You can use Android devices such as Samsung tablet, Amazon Fire tablets, etc with NetPlay app for complete system control. This is your lowest cost control solution. For iOS solution: Video Storm NetPlay has partnered with DTVGameControl for iOS solution for A/V control in the sports bar and restaurant industry. Working side by side with DTVGameControl, we have incorporated easy control functions for our signage, video wall and tiling features. NetPlay is fully integrated with Control4, RTI, and Savant. NetPlay also includes its own control system (NetPlay Mobile) optimized for commercial systems such as sports bars. NetPlay AV is designed and manufactured by Video Storm LLC. Video Storm provides competitive pricing as well as excellent pre and post sales support to our installer network. For the latest information on NetPlay for commercial systems, please visit our NetPlay Pro commercial estimator. Contact Video Storm at 214-295-5355 or sales@video-storm.com.